The ten-person task force will be chaired by CAA President DeWitt Godfrey and SAH President Ken Breisch. In addition to the chairs, the task force will comprise eight members with substantial experience in traditional and digital scholarship: two art historians, two architectural historians, a librarian, a museum curator, a scholar from another humanities or social-science field with expertise in digital scholarship, and a graduate student or emerging professional in art or architectural history. The need for evaluative guidelines has been expressed by professors of art and architectural history who have developed research and/or publications using digital technologies, have created new digital tools for interpretation and understanding of art-historical and place-based subjects, or have collaborated with other scholars to develop digital archives and resources; by professors and administrators who have responsibility for dissertations and promotion and tenure committees but lack the necessary tools to assess digital scholarship; by CAA’s and SAH’s editorial boards and advisory committees, whose journals and online academic resources now require guidelines to facilitate critical reviews of digital scholarship; by CAA and SAH publication and award juries who need protocols for judging the quality of digital scholarship to determine awards; by academic publishers; and by other disciplines and their learned societies. CAA and SAH anticipate that the guidelines will address different types of scholarly digital contributions: those that provide new resources, such as archives and new research tools (examples include SAH Archipedia and SAHARA); those that create scholarship in art and architectural history using publishing platforms such as Scalar and the JSTOR Current Scholarship program; those that create scholarship based on spatial and visualization technologies; and those that engage in new computational technologies. CAA and SAH anticipate that shared guidelines will reassure art and architectural historians that new forms of digital research and scholarship will be evaluated and credentialed; provide tenure committees with specific criteria for evaluating digital projects in art and architectural history; and ensure that digital scholarship can be evaluated and supported through juries and grants, thereby increasing awareness and participation of scholars in the digital realm. For more information, please contact Hillary Bliss, CAA development and marketing manager, at hbliss@collegeart.org or 212-392-4436. 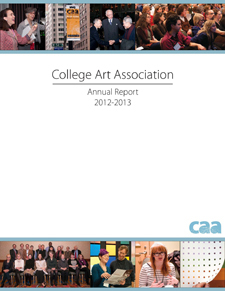 CAA has just published the Annual Report 2013–2014, which describes the organization’s accomplishments over the past year. You may download a PDF of the fully illustrated, twenty-three-page document. Abundantly illustrated by photographs from the 2014 Annual Conference in Chicago, the report presents a summary of an enormously productive year that included several major projects: a copublishing agreement with Taylor & Francis that brought all of CAA’s scholarly journals online; the ongoing fair-use initiative that will soon establish practical guidelines for the visual arts; and the restructuring of the individual membership program to better accommodate part-time faculty and independent art historians and artists. Also covered is an overview of the CAA-Getty International Program, which brought twenty scholars from around the world to the Chicago conference, as well as a selected list of grants received during the fiscal year and statistics related to CAA News, www.collegeart.org, and social media. An update on professional-development activities and a financial statement on the 2014 fiscal year close the report. 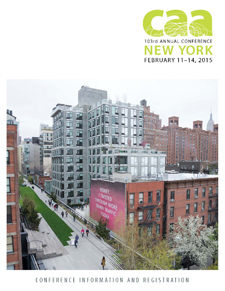 ARTexchange for the 2015 Annual Conference in New York is now full. The Services to Artists Committee invites artist members to participate in ARTexchange, the annual meet-up for artists and curators at CAA’s unique pop-up exhibition. This social event provides an opportunity for artists to share their work and build affinities with other artists, historians, curators, and cultural producers. 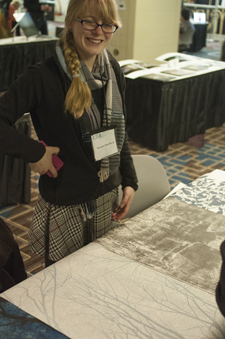 ARTexchange will take place at the 103rd Annual Conference on Friday evening, February 13, 2015, from 5:30 to 7:30 PM. This event is free and open to the public. Each artist is given the space on, above, and beneath a six-foot table to exhibit their works: prints, paintings, drawings, photographs, sculptures, and small installations; performance, process-based, interactive and participatory works are especially encouraged. Previous ARTexchange participants have found that this parameter sparked many creative display options. Depending on the number and type of submissions CAA receives, a schedule of performances may be created. Please note that artwork cannot be hung on walls, and it is not possible to run power cords from laptops or other electronic devices to outlets—bring fully charged batteries. To participate, send an email to Lauren Stark, CAA manager of programs. Include your CAA member number and a brief description of what you plan to present. Please provide details regarding performance, sound, spoken word, or technology-based work, including laptop presentations. You will receive an email confirmation. Because ARTexchange is a popular venue and participation is based on available space, early applicants are given preference. Participants are responsible for their work; CAA is not liable for losses or damages. Sales of work are not permitted. Deadline extended: January 9, 2015. Sheila J. McNally, professor emerita of art history at the University of Minnesota, passed away in Minneapolis on September 24, 2014. She was 81 years old. McNally graduated with a BA from Vassar College in 1953. Following studies at the University of Kiel, the University of Munich, and the Radcliffe Graduate School of Arts and Sciences, she received her PhD from Harvard University in 1965, writing a dissertation on “The Role of Ornament in Protocorinthian Vase Painting.” After serving as a lecturer and instructor at Ohio State University and Mount Holyoke College, McNally joined the faculty of the University of Minnesota in 1965. Until 1987 she was a member of the Art History Department; between 1987 and 2004 she was affiliated with the Department of Classical and Near Eastern Studies; and then from 2004 until her retirement in 2010 she was again a faculty member in the Department of Art History. Over the course of her long career McNally was widely recognized as a dynamic educator and accomplished scholar. In addition to numerous publications on Diocletian’s Palace in Split, Croatia—including her 1996 book The Architectural Ornament of Diocletian’s Palace at Split—her work engaged Coptic Egypt and the art and archaeology of monasticism, as well as Greek and Roman sculpture, mosaics, and pottery. She served as a member of the board of directors of the College Art Association and Mid-America Art History Society, and as a member of the advisory board of the Women’s Caucus for Art, the board of governors and other committees of the Archaeological Institute of America, and the Rome Prize jury of the American Academy in Rome. McNally was a pathbreaking scholar and archaeologist—among the earliest women to make a name for herself in a field long dominated by men—and was an inspiring role model to young women in the field of Classical archaeology. She will be remembered as a passionate individual who lived her life in an utterly unique fashion, and will be missed by all who knew her. Contributions in her honor can be made to the Sheila McNally Fellowship Fund (care of the Department of Art History), which supports graduate students pursuing the PhD in the art and archaeology of the late antiquity. 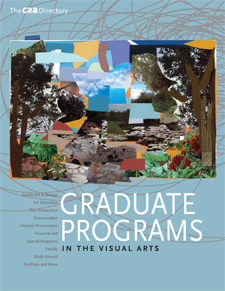 CAA’s 2014 editions of Graduate Programs in the Visual Arts and Graduate Programs in Art History are comprehensive resources that feature updated information about 630 programs in 400 schools in the United States, Canada, the United Kingdom, Europe, and beyond (see sample entries). The directories provide prospective graduate students with the information they need to begin the application process. The directories are also key professional references for career-services representatives, department chairs, graduate and undergraduate advisors, librarians, professional-practices educators, and professors interested in helping emerging generations of artists and scholars find success. Entries from the following program types are available: History of Art and Architecture; Studio Art and Design; Curatorial and Museum Studies; Arts Administration; Art Education; Library Science; Film Production; and Conservation and Historic Preservation. New this year, CAA is offering PDF files of individual programs (updated in 2014) free of charge with the option of free customized PDF files, created on demand, based on the user’s preferred search criteria. Anyone can search the directories online by program type, faculty specialization, awarded degrees, country, region, state, availability of health insurance, and whether or not part-time students are admitted, or browse the directories by institution and download individual institutional records as PDF files. Search results include the program type, its location, and the program name and description, while the PDF file gives an in-depth profile of each program. Print volumes offer several delivery options; e-books (as PDF or ePub files) can be downloaded twice and are compatible with your personal computer and most smart phones and ereaders (excluding Kindles). Please note that the individual, program-specific print volumes were last updated in 2013 and are available at a discounted rate. Individuals can order through CAA’s website. If you are ordering for a school, institution, or department within a college or university, please download the order form and return the completed version with payment to Roberta Lawson, CAA office coordinator. We are unable to process Institutional orders online. Your order will be processed within three to five business days. For more details, visit the CAA website. For questions about purchasing, please contact Roberta Lawson, CAA office coordinator, at 212-392-4404. Linda Stein. HUB Gallery, HUB-Robeson Center, Pennsylvania State University, University Park, Pennsylvania, September 5–November 20, 2014. The Fluidity of Gender: Sculpture by Linda Stein. Sculpture. Michelle Handelman. NewFest, Lincoln Center, New York, July 27, 2014. Irma Vep, the Last Breath. Single-channel video. Michael Rich. Old Spouter Gallery, Nantucket, Massachusetts, August 8–21, 2014. A Season’s Journey, Not Far from Home. Painting. Angela Ellsworth. Lisa Sette Gallery, Scottsdale, Arizona, January 2–February 1, 2014. Volume. Works on paper and cardboard. Michelle Handelman. Outfest, REDCAT, Los Angeles, California, July 19, 2014. Irma Vep, the Last Breath. Single-channel video. Dissertation titles in art history and visual studies from American and Canadian institutions, both completed and in progress, are published annually in caa.reviews, making them available through web searches. PhD-granting institutions may send a list of their doctoral students’ dissertation titles for 2014 to dissertations@collegeart.org. The complete Dissertation Submission Guidelines regarding the format of listings are now available. CAA does not accept listings from individuals. Improperly formatted lists will be returned to sender. For more information, please write to the above email address or visit the guidelines page. Deadline: January 15, 2015.